Since I started food blogging I have not been eating out nearly as often. When I was eating out it was commonly at pubs and every once in a while I get a craving for pub food. One of my favorite things to order at a pub is fish and chips. Up until now I have not tried to make fish and chips at home as I was worried about deep frying. It had been too long since I last had fish and chips and I was craving it. It was time to try making fish and chips at home! I had seen the fish described as being beer battered on several menus and I wanted to try making beer battered fish. I went with cod for the fish but you could use pretty much any white fish such as haddock or halibut, etc. For the beer I went with Guinness and it gave the batter a nice dark colour. I was surprised by how easy the Guinness battered cod was to make! The batter was nice and light and crispy and the fish was moist and tender and so good! To complete the pub fish and chips experience, I served the fish with chips , cole slaw , tartar sauce , lemon slices, malt vinegar and of course a pint of Guinness. Mix the beer, flour, baking powder, salt and egg into a batter in a bowl. Dredge the fish in the flour and shake off any excess. Dip the fish into the batter. Fry the fish in preheated 375F/190C oil until cooked, about 4-5 minutes. Option: Serve with Chips (French Fries), Tartar Sauce, Cole Slaw, etc. wow~ that looks just like the fish and chips I had in Scotland last month. youre pro. I want to try this at home too. it look so crispy! This looks awesome. My vegetarian brother is visiting me so I think I’m going to make 2 versions of this – one with fish, and one with tofu! Fish and chips! That’s one of my all time favorite meals. How lovely that plate looks. Mmmmmmm. Very nicely done, as always, Kevin! I haven’t had beer battered fish in a long time; I miss it! I don’t have a deep fryer … do you think this could successfully be accompished frying in a skillet? As always, your food presentation is lovely. Paula: I used a large sauce pan and poured a couple of inches of oil into it. that fish looks amazingly crispy! yum…now i’m craving fish and chips. Kevin, I don’t think there is anything you can’t do! Looks delicious! I just had some fish and chips the other night at a local brew pub. Unfortunately, it was not good! I have got to learn to make my own at home. Beer in fish? Or fish in Beer? I think my hubby would love this:) Sounds and looks delicious. What an interesting idea! That looks perfect! I love fish and chips, but I have never thought to try it at home…now it is a must! Arh, I’ve been aching for true-blue fish fillets for some time now! You’re right to go with the beer batter– absolutely the best way to do it. And lovely close-up pic too! I love being able to replicate food from eating out at home! Fish & chips is almost the thing I always order at cafes! Yours look great with fries and coleslaw! wow this one sounds so good! I so want to try this out – do you think normal beer will taste as good? What a perfect meal! Everything looks awesome–the crispy fish, the golden fries, the creamy coleslaw . . . Mmmm! Mmm…I love fish & chips. This meal looks yummy! Did you make your own tartar sauce? Wow Kevin, that looks so good. It looks SO crispy. I LOVE fish and chips, and now you are making me crave it. Great looking fish & chips, Kevin…looks like the real deal from a chip shop! That looks amazing! One of my favorites. Where do you live?! oh I love magpie’s idea of vegetarian fish and chips. Yum! I love fish and chips. Yours looks better than any I’ve been served – gotta gather the courage to deep fry at home! That fish looks so yummy, moist and tender! Now.. what to do with all the leftover oil? Ooh, I love fish and chips with lots of malt vinegar! And awesome idea to use Guinness in the batter! This is so getting bookmarked right next to the Strawberry Rhubarb Jam. You don’t eat out as often? I thought you eat in everyday since you have something up your cooking sleeves almost every day. Where ever did you get the time to cook something new everyday? I love love love fish and chips. This is definitely not enough for me. I need 2-3 pieces of that beer battered fish! That’s a good looking fish & chips. Looks like you master the Art! Nicely done. The Guinness was a stroke of genius…both in the batter and with the meal! I love a good fish and chips. Yours looks perfectly crunchy with a nice sized piece of fish. Sometimes you get barely any fish in all that batter, but yours looks spot on! I am new to your blog today, and have to tell you how impressed I am. You are fantastic! I have sat here tonight and looked through nearly all of your recipes (pathetic I know) and am so excited to have found you! Thank you for sharing your amazing talent! This is super cool recipe,had once tried with prawns, was great !!!!!! Adding guiness sounds more better. Your batter looks perfectly crisp! Fish and chips allways remind me of UK, they have that almost everyday for lunch, but I must say you’re lokks much better than most of theirs, lol! I love fish and chips and these look real tasty! I’ve got some fresh fish and was wondering what to do with it. This sound like a great idea. I’ll let you if I was as successful as you. I’m coming over! That looks so good. I love fried anything – ha ha. Oh this is fantastic! A classic British meal. I love beer in the batter, which look sreally crispy by the way. Tartare sauce is one of my fave condiments too. Great recipe! 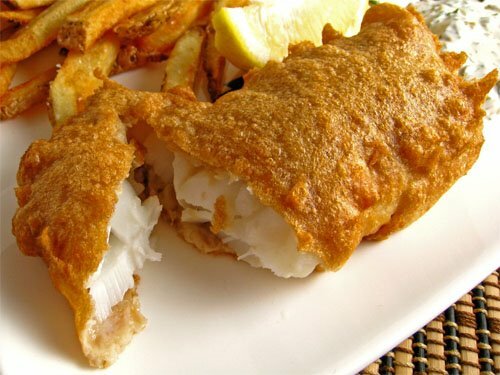 We love beer-battered fish, but have never tried it with Guiness before! I think Cod is the best for fish and chips. Oh this looks so yummy! Just left the grocer, maybe a trip back is needed. I love beer battered fish! Yours looks so good I’m drooling! wow how brave I ususally only get this when I am out. Looks delish. That looks better than any fish and chips I’ve ever had! And the presentation of your food is magnificent, as always! So delicious looking! No need to eat at a pub if you can make this at home. Save the pub for the beers! Please can you send some over here for my dinner? That looks lovely Kevin. Yum! I love fish and chips! I made it for the first time a few months ago, and I was also surprised at how easily it came together. How did you make your “chips”? The last time I had fish and chips I was sick for 4 days. We think the restaurant was using very old oil to fry the fish. This was a couple of years ago and I’m still squeemish about trying it again. What a great looking fish and chips.. usually when I get it at a restaurant, it looks like a mess. Looks YUM! Your batter is perfect. How do you do it, Kevin? Simply amazing! Mmmm fish and chips, good call, been awhile since I had this also. Looks fantastic. Like the beer batter. I love fish and chips! I’ve been craving it lately, too, but there’s no where around here to buy decent fish and chips. I guess I’ll have to make it myself! What a nice plate. I would trade this over a restaurant meal. that could totally pass for professionally-done. most impressive! I love this! Beer battered fish are soooo yummy! Flakey, moist, delicious…I could go on and on! I just bought a good amount of cod from Whole Foods the other day and was hoping to make fish & chips. Does the beer really help to make it better? 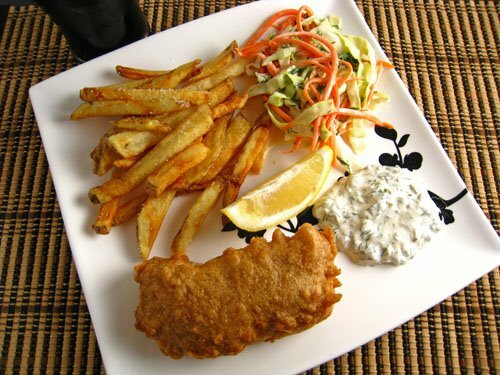 Bobby Flay has a really good recipe for fish & chips with a habenero tartar sauce (he puts hots in almost everything). Your fish & chips look so crispy. I can’t wait to try this Kevin. it looks totally perfect Kevin! Wow, it couldn’t get better than this! The only thing missing in this delicious looking fish n’ chips is a newspaper to put them in. How cool would that be. Kevin, your fish would rival any restaurant! Crispy,crunchy and dark golden brown! Okay Kevin, This is my monday night dinner. I hope it turns out half as good as yours looks! As an Englishman marooned in Oklahoma I must say that your fish and chips look absolutely delightful. You’ve inspired me to talk my wife into buying a small deep freeze so we can purchase and store better seafood than is obtainable locally. This would enable us to enjoy tasty seafood such as shown here. WOW! The last Fish & Chips that I had that looked that good was in Tobermory, Scotland. And you did it in what you call a “closet kitchen”??? Oh does that look good. That crispy outer coating looks perfectly done! I can just taste it by looking at it. Wonderful! I’ve done the beer battered to make fish tacos. I was surprised how easy it was to make them well too. Good fried fish is just awesome. I make this batter all the time! Normally I do it with some bass or bluegills it’s great. My husband would love this. He lived in England and he misses his fish and chips.Looks real good. Mmm so good. This is one of my favorites. Kevin, everything on that plate looks absolutely incredible!! Whoa, this looks way too good, I want it NOW! I’ve never attempted beer battered fish either but thats about to change. Nice work! looks like one great meal! That looks so good, Kevin! Thanks for sharing the recipe. I will definitely try it. I just came across your simple, but fabulous recipe for fish and chips. I am so glad I found your site. I intend to cook up many of your recipies. The Yard of the Week featured in last week’s Mt. Vernon, Illinois Register-News is almost my Aunt ßetty’s house in Florida. I got to stay with Aunt ßetty for a couple weeks when I was a kid of about nine years old. I remember Uncle Bob and I made a crystal radio set. Oh, it was so fun. And Aunt ßetty cut up an avocado for me to eat, it was good but I thought it smelled strange. I’d give anything to smell it now, as I lost my sense of smell about four years ago due to my allergies. And despite having sinus surgery earlier this year, alas, my smell is still gone. Oh, and those special, special Tupperware containers Aunt ßetty kept her cereal in. I used to catch those little lizards in Aunt ßetty’s yard. Oh, I’d pop them right in my mouth and bite their juicy and crunchy little heads off. And then their little headless bodies would do that little devil-dance for a minute or two. Anyway, Aunt ßetty’s house was the same kind of sea-green color. And to make a long story short, the Yard of the Week is right down there near the end of my street, Airport Road! Last year I could have nominated my own house for House of the Week, but that da-gummed Ameren went and killed our pretty pine tree. You know, the irony of where I live will astound you. I am sandwiched in-between teacher neighbors. To the east, we have my Niece and Nephew’s kindergarten teacher at Belle Rive. To the west is my own Kindergarten teacher’s from Belle-Rive house, who sadly passed away a couple years ago. Her grandson lives there now. He and I occasionally drink some beer and talk (argue at times) politics. He is a right-of-center Republican and I am a left-of-center Democrat. I sure wish Uncle Bob was still around. I accidentally dropped and broke one of his magnets one time and instead of scolding me, Uncle Bob explained to me the electro-magnetic force. He passed away back in the early eighties. I wish him and I could get together and talk scientific stuff. I am named after him, after all. I’d love to talk with him about Super-Symmetric String Theory. I’d love for him to see the brand spankin’ new Large Hadron Collider that is about ready to go online. Poor old Uncle Bob, I sure do miss him. Remember the Mr. Wizard science show for kids? Going to his house was like going to see Mr. Wizard live in person. He even looked like Mr. Wizard. It is time for me to make a pilgrimage to Clearwater, Florida. I want to be down there at Uncle Bob’s grave on September 10th, the day the Large Hadron Collider at CERN officially goes online, so I can just sit near his- one of my greatest mentors- grave and tell him that one of Humankind’s greatest scientific instruments has finally gone online. Wow! this looks so good! I bet the beer added good flavor and crispiness to the fish. You should really consider submitting this recipe to Cookthink’s Root Source Challenge — lager is an upcoming featured ingredient. If you win, we’ll send you a cookbook and publish your recipe. I like cooking and I live in Japan, so you can imagine the problems I have with getting real western food. I usually surf the net looking for recipes that have a taste of home. I’m from the US, but I love fish and chips as does my family. When we decided to make fish and chips I googled for a recipe and your came up and I chose yours. I was very good. The only thing I would like to is that you recipe makes quite a bit of batter. For a family of three half would be fine. Brilliant. Big fan of fish (curry, bbq, stew), but didn’t have my first fish and chips until about a yr ago. now a key part of my diet! Will give this one a shot. I made this fish last night. The batter was light, flavorful and not too thick, just what I was hoping for. I didn't have Guinness and I think the batter would have been better with the darker beer. But it was still delish. I was worried about not having enough batter, my piece of cod was 1.69lbs, so I did a batch and a half and ended up with a lot of leftover batter and nothing fun to fry (I want to try frying a Mars Bar next time). Thanks for the wonderful and easy to follow recipe! I really like your blog and the recipes I have tried so far are great. However it would be nice to see some recipes that use fish that are sustainable such as pollock, pouting or one of the many other under used fish species. Cod and Haddock are massively over fished and we should all seek to guard them for future generations. Well…I made it, ate it, loved it. And now I'm going to retire my deep fryer for another 6 years (no joke)…thanks for another winner. I'm going to try this recipe but what kind of oil did you use?? Photogirl: I usually use a corn oil for frying fish and chips. This looks great!!! I will try this I havn't have fish & chips for long time since got here in U.S from UK. I am dying for it. I made this today. It was absolutely amazing! :] thank you for the recipe!